Proof that one-metre deep, compressed air de-compaction has lasting benefits on bowling greens can be found at Gelligaer Bowls Club in South Wales where Terrain Aeration have returned with their Airforce terralift machines after eight years. The bowls green was originally treated in 2002 during mid season because of poor grass growth, standing water following rain and sulphurous smelling emissions from the upslope end. "The first match of the year had been played using standard bowling mats to protect the grass but the grass had failed and gone black in some of the wettest areas," remembers David Green, Terrain's MD. "Play on some areas of the upslope end had been poor because the woods had consistently failed to curl." Built into the side of the valley, the green forms a terrace with the down slope end on well drained black soil. Green says that this half of the green was in excellent condition, both in appearance and the way it played. In contrast, the upslope area, dug out of the mountain side had a subsoil of heavy but not wet clay with small areas of sandstone bedrock at about 600mm below the ash base of the green. The saturated surface, overlying a relatively dry subsoil led Green to suspect that the ash layer, which had originally come from the steam boiler at the local colliery had become cemented and was forming an impermeable layer preventing drainage. Using a hydraulic hole preparation machine, Terrain Aeration punched holes through this layer before bringing in their Airforce terralift to insert a steel probe one metre below the surface. Compressed air was then injected through the probe creating fractures and fissures, breaking up the subsoil and providing air channels from one metre depth, all the way to the surface. Dried, milled seaweed, injected on the final air blast ensured, as it swells when wet these new channels stayed open. Working at two metre spacings on a staggered grid pattern, the terralift was used to treat the whole green. The operator reduced the air pressure on the down slope as the sub soil conditions were softer, so that the surface remained un-disturbed and following treatment the probe holes were filled with Lytag. Four hours later, the wettest areas of the green had dried, and the surface was checked for flatness and curl. To the bowlers delight, flatness was deemed acceptable and the curl was restored. Two days later the entire green was cut ready for an important county standard match, reported to be a great success. The long-term success of this treatment is the reason that Simon Beacham, Senior Parks Officer for Caerphilly County Borough Council has brought back Terrain Aeration, not just to re treat the green at Gelligaer but eight more within the county. This time they brought their new, improved Scamper terralift designed especially for bowls greens. "They did five for us pre-season and they've come back to finish one and do four more," he says. 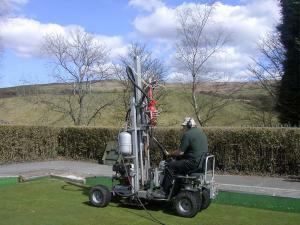 "The de-compaction treatment has had a big impact on the greens. Basically they were all compacted and taking a while to drain away. All the clubs are happy."